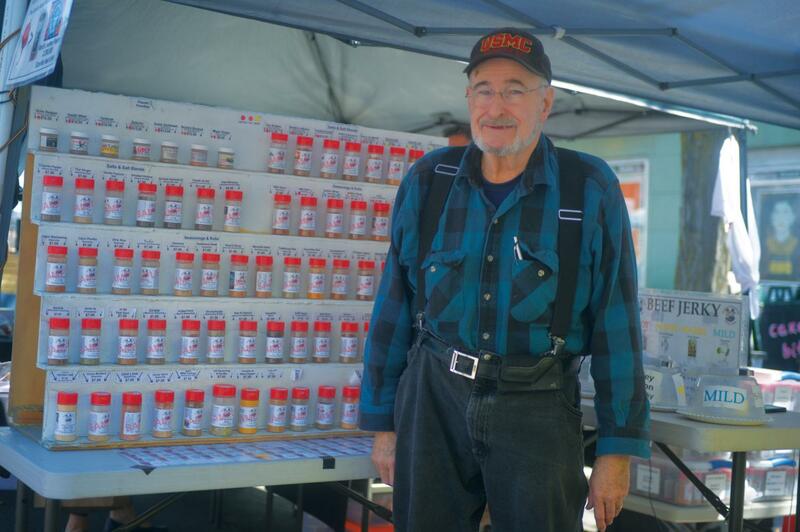 Ray Templeton, owner of Redneck Seasonings, shows off the variety of spices he offers at the Moscow Farmers Market on Saturday. Ray Templeton, owner and founder of Redneck Seasonings in Moscow, started his business with the goal of providing spice-seekers willing to submit their stomachs and taste buds to a bit of suffering for the flavors they crave. His son-in-laws were Templeton’s original inspiration and taste testers. Charon is another more popular seasoning that’s main ingredient is vanilla infused sea salt. Templeton characterized several of his unique creations as difficult to describe. “You have to taste it to understand it,” he said about his Memphis Belle barbeque seasoning. Redneck Seasonings also sells jerky flavored with the spice mixtures Templeton creates. The beef jerky he sells is given high praise by anyone that walks by his booth at the market and has a taste, he said. Other products Redneck Seasonings has put its spin on include teas, coffees and candies. Templeton said the creative and unique aspect of creating any spice mixture that finds its way into his head is his favor part of the business. Templeton has brought Redneck Seasonings to the Moscow Farmers market for the past several years and has become a staple of the event.